This project is located in the inner western suburb of Leichhardt, well known as the “Little Italy” of Sydney. 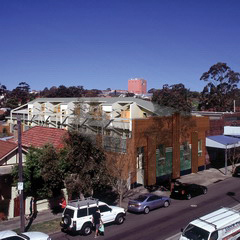 It is the conversion of an existing warehouse into 6 x 3-storey townhouses. The new units are designed to correspond to the existing structural bays in the warehouse . The northern half of the roof will be removed to expose the existing structure so as to introduce natural light into the units. All the units will face north towards their own courtyard. The existing streetscape will be improved by the elimination of the loading dock and the enhancement of the existing art-deco motives.